Northern Irishman says he hasn’t lost any of his pace. Hibs forward Ivan Sproule has said that he hasn’t lost any of the searing pace that marked his first spell at Easter Road. The Northern Irishman, who returned to the Edinburgh club after four years at Bristol City, was renowned for being one of the quickest players in the Scottish game and he says that although older, he still has pace to burn. 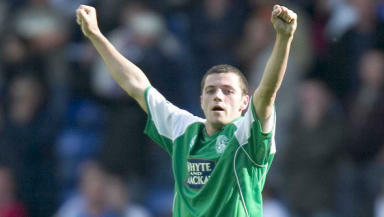 However, he acknowledged that there were some youngsters in the Hibs squad who may give him a run for his money. Sproule says his greatest asset had served him well during his time in England and that he had yet to find anyone as quick. "I've never timed myself,” he told Hibs’ official website. “I just judge it I suppose on who can beat me and I have never across anybody down in England or in this squad who could. "It is just something I was born with - I was blessed with it. I've been very lucky, touch wood, that I've never had any troubles with my hamstrings. "There are a few quick lads in this squad as well, but I still like to pride myself on being the quickest one there. My title is there to be shot at though and I've got a few more grey hairs around the side of my head now. "So a few of the younger lads may fancy themselves to beat me. I've been very lucky with my pace and hopefully it can continue to run on for another few years." Sproule added that though he had received a good reception from the club’s support on his first friendly since returning to the club, he knew he would have to earn their backing with good performances. “As soon as I came out of the tunnel, straight away they were singing my name again,” he said.”It is something they've always done for me. "I think that even if you're not having the greatest game in the world then as long as you are putting the effort in and showing that you want to play for the jersey then that means a lot to a Hibs fan. "As I say, I'm a Hibs fan myself, so I just want to give it 110% every time I go out there. I put pressure on myself to do well. I will demand more from myself and obviously I will know myself when I'm doing the right things on the park. So I'll deserve the plaudits then for the right reasons."